It's time to rock your online parties! 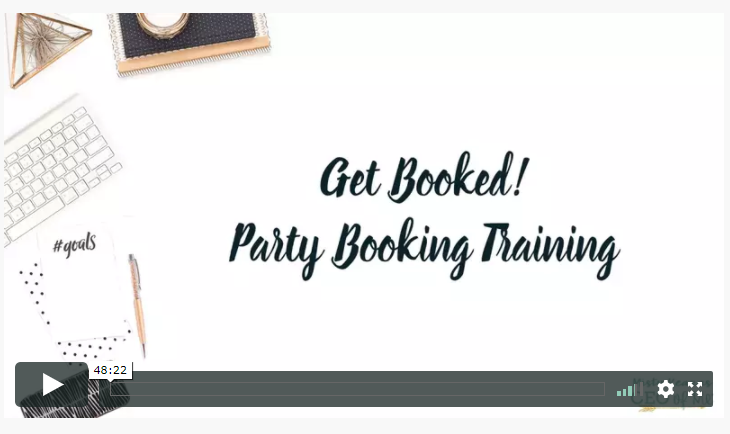 In this online training course I'm spilling all my secrets and giving you step by step plans, checklists & tools so you can have bigger, better (and way more fun) Online/Virtual parties in less time without all the stress! I have a secret to tell you... I don't really like to do home parties. (GASP!) I know, I know, I'm not supposed to say that... Ya'll, I'm an introvert and I love working from my own home on my own schedule in my own comfy pj's... That's what being a CEO of Me means to me - doing your biz your way! When I started in my direct sales business, I didn't even hold a home party for almost 8 full months! However, during those 8 months I had replaced my previous full-time income already mostly from doing online parties, networking and recruiting through the internet and social media. Home parties are great and they can be very profitable, but with the internet, there is so much opportunity to truly have a work at home career now (or supplement your business with online parties between your home parties!) I loved to party online, get sales to help my hosts earn free products, connect with new customers and help them find products they loved. I was also able to find lots of new potential recruits to build a relationship with and welcome to my team - all from the comfort of my living room! Plus I could do 2-3 parties a week in the same amount of time as it would take me to do just ONE home party. That's triple the sales, income, bookings and recruits for the same amount of work (and I could work from my living room in my pj's - did I mention that already?). I see so many direct sellers who are struggling to get online parties booked or get many sales much less more bookings and recruits from their online parties. There's more to it than just posting about your parties and sharing product pics and videos or jumping on a FB live and talking though. You have to have a system and offer online parties that are engaging, fun, authentic and easy for your hosts and guests to participate in (and fun and easy for you too!). If you are doing the same ol' party format you see everyone else doing and just posting a bunch of "salesy" posts for 30 minutes to an hour, you aren't going to get the results you want. I developed a really simple party formula that hosts & guests are excited to participate in because the parties are so much fun, authentic, personal and engaging! It's all about the experience you create and having an efficient system that makes it successful! I have now trained hundreds of other direct sellers in a variety of companies on this system. Even though the framework is the same, they are able to use their own unique personality, passion, branding and style to make the parties their own and still get tons of sales, bookings and recruits too (and stay out of FB jail too). I cover so much more in this course than just the system and framework for online parties though. I share tips for confidently marketing your business online, tech tips for using FB, creating videos & images, rocking your FB Lives (yes even if you are an introvert or terrified of the camera), getting bookings, host coaching, getting recruits and creating an effective follow up system that gets you repeat business and referrals! I want you to have everything you need to create a fun, engaging, effective online party system of your own that saves you time and gives you more results so you can enjoy the perks of your home based business too! 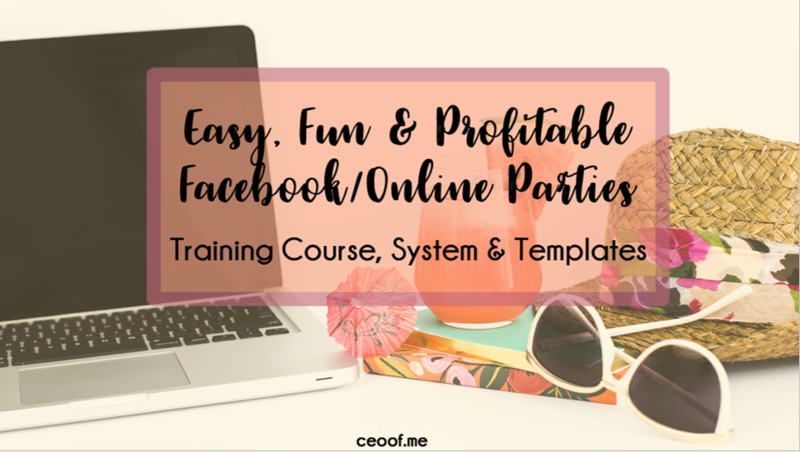 I've put all my systems, tools, checklists, tips and training together into this course to help you rock your online parties! What are Virtual Parties & How are they Held? on how to create and edit your own images and videos. Are you ready to increase the average sales of your Facebook parties plus get bookings & recruits? Do you want to have guests who rave about your parties and come back to shop again & again? Would you like to feel confident about doing your own awesome videos & live demos? Do you want to save time by creating a simple system for all your parties that's fun & easy? How much of an impact would an extra $100-$200 one, two, three or more times a week make in your life & business? How about being able to make that extra income without having to leave your house? feel more confident about booking parties & get better, bigger results in less time! Hello! 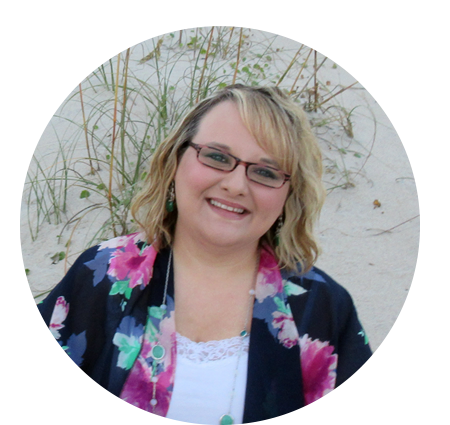 I’m Misty Kearns, Certified High Performance Coach & Founder of CEO of Me®. Hey ya'll! In case you are wondering about the person who is offering this training to you, let me share my story. I'm an introverted. small town girl from North Carolina who started in direct sales 10 years ago for the discount with no intention of building a business. After losing my full time job and not wanting to go back to the corporate world, I decided to dive into the business until I figured out what I was going to do with my life. I was deep in debt and not sure what was going to happen, but I knew I wanted something more for my life and a career I could be passionate about. While all that is amazing, I believe that direct sales is about so much more than the income & prizes. It is about using what you gain from the business to help you reach your bigger goals in life and to make a difference in other's lives. I have loved getting to be my own boss & am passionate about empowering others to be more confident, authentic & successful. After being a Top Leader with my company for many years & having other direct sales friends ask me to start sharing my systems, tools and training, I created this blog, CEO of Me in 2011. In 2013, I decided to become a Success Coach so I could help even more direct sales professionals reach their goals and become CEO of Me's too. My superpowers include being an authentic marketer and creating & implementing systems. I lead and coach by empowering and helping others learn how to use their own unique strengths to succeed & then helping them create a plan for success. I built my team and business primarily online for 10 years. I know what to do (and what not to do) to grow a successful direct sales business online. 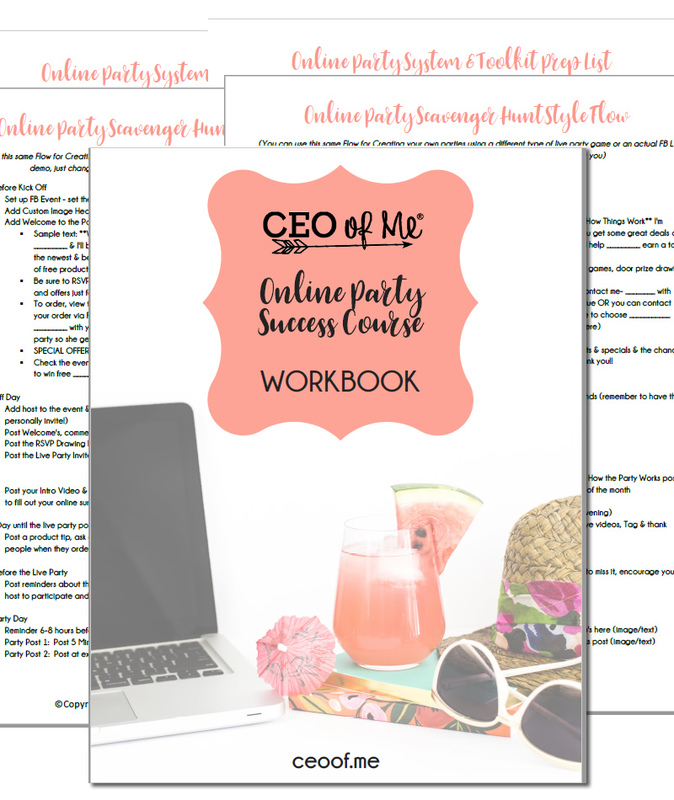 I'm excited to share my strategies and system for having super successful online parties with you so you can grow your business too! 1. 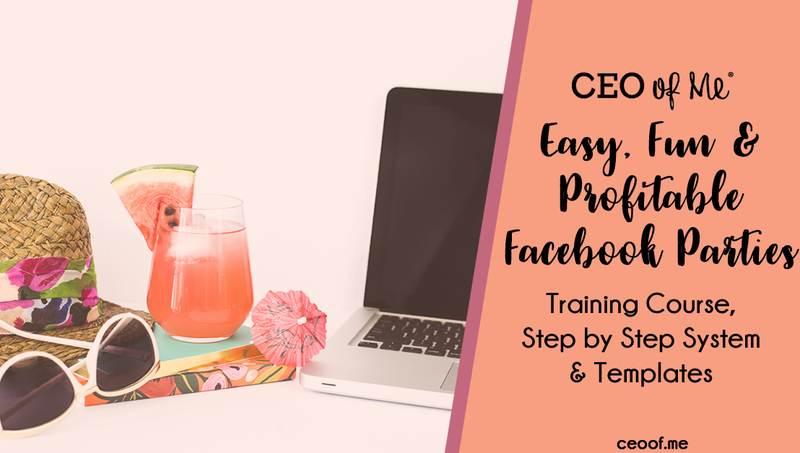 Having a simple system for success with your Facebook parties will give you more confidence & save you hours of time & frustration trying to figure this out and set everything up on your own. 2. Creating your own unique online party flow that includes all the important aspects of a successful party will enable you to increase your sales, bookings & recruits from your parties & keep you out of Facebook jail. 3. Your hosts & guests will be excited to host & participate again and again in your parties because they will be fun, authentic, personal and engaging! No more boring, same ol' text & links party formats here! You'll love being able to hold parties that work for you & your unique personality! "This﻿﻿ ﻿﻿﻿﻿training﻿﻿ rocks! Just finished and am inspired to get started!" 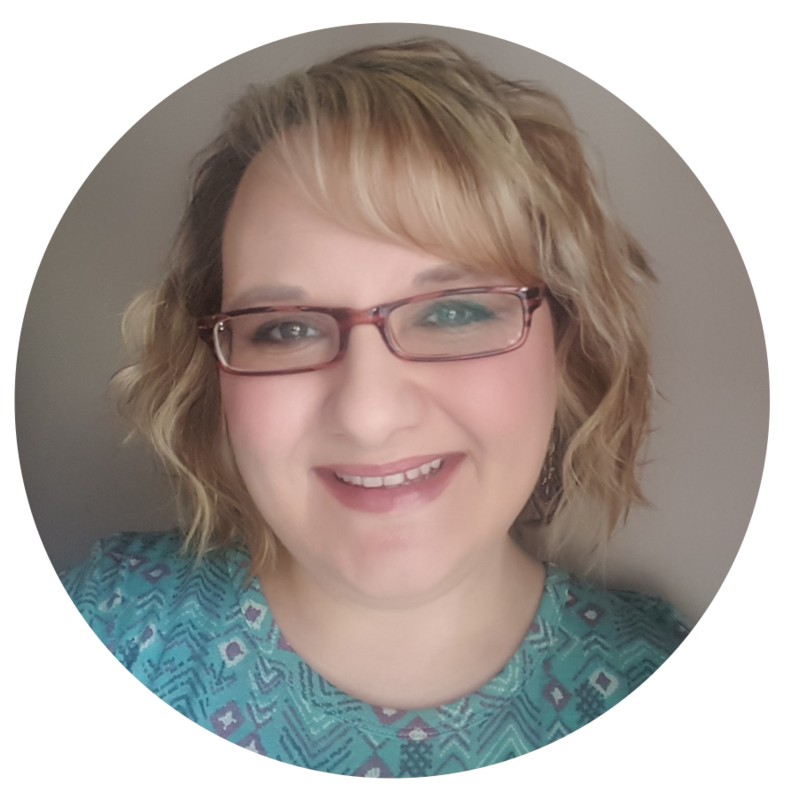 - Stephanie S.
"I have been wanting to do online parties for a while but really did not know where to start. Your training has helped me feel totally prepared to do them now." - Nicole M.
Order Now for only $197 - $77 Special Savings! + Get my Bookings Training Program for FREE! SPECIAL OFFER - ONLY $77 - No Coupon Needed! Buy Now for Only $77! OR Get this FREE when you register for my Mastermind & Success Course! All sales final. No refunds. This is digital product. You will receive access to the download links after purchase. By purchasing you agree to our terms.